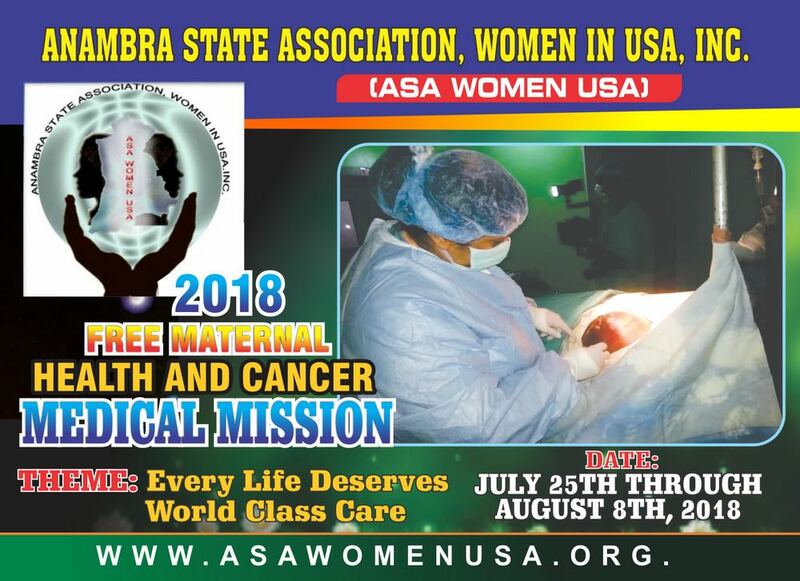 ASA Women USA will be embarking on her 4th Cancer and Maternal Health Medical Mission to Anambra State from July 25th thru August 8th, 2018 in collaboration with Anambra State Government, MedStar Georgetown University Teaching Hospital, Washington, D.C, and Medical College of Wisconsin, Milwaukee, WI; in association with the three major surgical centers at Nnamdi Azikiwe University Teaching Hospital (NAUTH), Nnewi, General Hospital, Onitsha, St. Charles Borromeo Specialist Hospital, Onitsha and the other Non Governmental organizations. Purpose: The purpose is to offer Free Breast, Cervical & Prostate Cancer Advocacy, Education, Awareness, Cancer Treatment Center Research, Screening, Medical and Surgical Services to the under-privileged & improve maternal health status and overall well being of all citizens in Anambra State –Nigeria. To donate diagnostic medical equipments and to participate in the Coordinated 2018 Post Surgical Care of the identified cancer mission patients. The identified breast, cervical & prostate cancer/ suspected lesions, ophthalmological, gynecological and other general cases will be transported to the three surgical centers for further biopsies and surgeries during the mission period that ends on August 8th and for the follow-up Coordinated Post surgical care of the patients. All other patients (men, women & children) with chronic conditions will be medically treated on that day.